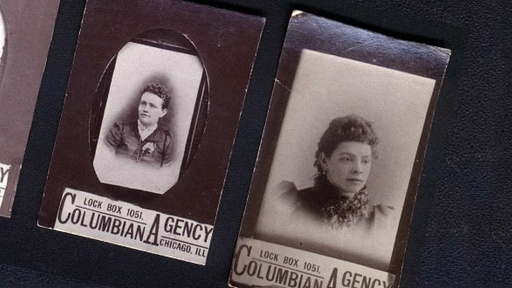 In California, a photograph collector owns four small images of women taken in Chicago in the 1890s. On the back of one are the woman's personal details and comments about her inheritance, leading their owner to believe these aren't just ordinary portraits but advertisements for mail order brides. History Detectives visits California and Chicago to investigate the Victorian marriage industry and discovers a shocking story of late nineteenth century extortion and corruption. Also in Emerging Modern America: 1890-1930 Red Hand Flag Is this peculiar flag one that African-American soldiers marched under in the war to end all wars? Also with Tukufu Zuberi Atocha Spanish Silver What are these markings on a silver bar discovered in the wreck of a Spanish ship? Also in Season 2 Red Cloud's Peace Pipe Was this pipe given to an Indian agent by the famous Lakota warrior Chief Red Cloud?